History: The Benin Kingdom situated in southcentral Nigeria dates to approximately 900 A.D. The first, or Ogiso, dynasty lasted until 1170, at which time Yoruba rule was imposed from the city of Ife. Oranmiyan, the son of the Oni of Ife, was sent to Benin City where he wed a Benin woman. She bore him a son, Eweka I, who became the first Benin Oba. Sometime during the 13th century, Iguegha, a caster, was brought from Ife to craft memorial heads of the Obas. Terracotta heads in collections have been dated to the late 15th or 16th century and were used by the Ogiso rulers on altars to their paternal ancestors. 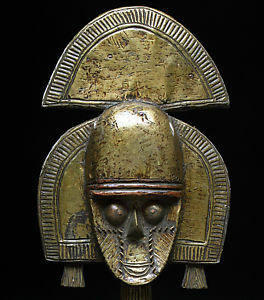 Benin art became well known to the West in 1897, after the British Punitive Expedition sacked the city of Benin and brought thousands of objects back to Europe as war booty.